Bottle gift bags with rope handles and gift tags. Sold in silver, gold, red or black. Personalise carrier bags with your own logo or design to give an extra boost to your company. Just fill in a printed carriers form for a quick quotation. Make sure to check our latest offers a save money or sign up to our newsletter to have a chance of winning a gift! Then we can make it! Just fill in the custom order form and we will manufacture it for you! Carrier bags are usually manufactured from polythene but can also be made from alternative eco-friendly materials such as potato starch. Carrier bags are most commonly produced for shops, stores and supermarkets to give to their customers and so are the best known type of 'Retail Bag'. 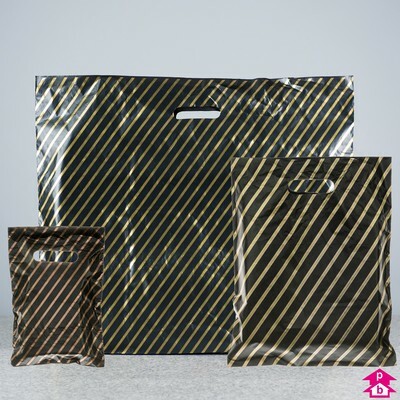 Retail bags are produced in different styles and sizes, with a gusseted size or a flexi-loop and many other options. However the vest-style carrier bag is probably the most traditional type as they are economic and strong. Clear plastic carrier bags are made from strong varigauge film. Varigauge because they are thicker around the handles to give extra resistance and thinner toward the bottom. Clear poly bags are completely see-through meaning customers can see what is inside clearly. This type of carriers can comfortably hold up to 5kg. Heavy duty carrier bags are suitable for multi-uses including food, use small plastic bags to packing food and large plastic bags to protect your items or pack heavy items. Lightweight and durable these heavy duty poly bags are available in many sizes and models. Printed carrier bags offer an economic and effective marketing solution. 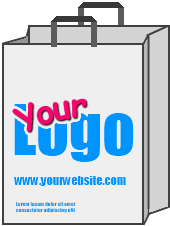 Printing a logo or a website address on a shopping bag can help getting the name of your company on the market for a low cost. Customer that by from you will carry the bag wherever they go allowing for other people to see and chances are big that they will come to your shop. Polybags is the UK leading manufacturer and supplier of polythene packaging and they also offer custom printing services, so if you need to promote you company by having your brand printed make sure to visit Polybags and just fill a printed carrier bags form with your request. Having your logo or message printed on retail bags is one way to get to your customers but another great idea is to provide environmentally friendly carriers and your customers will notice that you are concerned with the environment and will give you more credit. Biodegradable carrier bags will break down when disposed of with industrial compost. Biodegradable bags can also be manufactured from potato starch which is 100% renewable and sustainable and will completely disintegrate into CO2, water and biomass in about 12 weeks if disposed in standard composting conditions. For smart alternative to traditional polythene carrier bags, paper bags could be a great solution. Paper carrier bags are strong, smart and biodegradable and they are generally made from materials like kraft, duplex and art card. Eco-friendly, recyclable and resistant, paper carriers can be used for food packaging, the well known 'take away' bag, as well as a shopping bag. 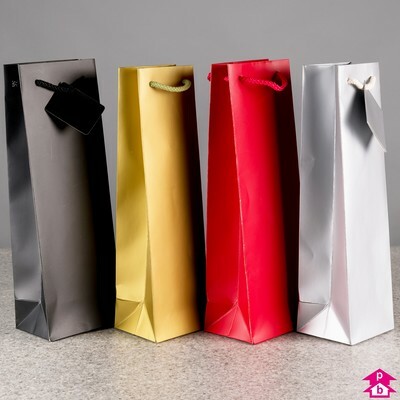 Paper bags can also be ordered with customized printing and with different handle designs, styles and colours. Great for jewellery stores and gift shops. Black high density carriers with punched out handles and gold diagonal stripes.